Clearly you remember your parents saying when you were little “Don’t eat dinner without washing your hands first!”� We say “Don’t wax your boat without polishing it first!”� Just like eating dinner with dirty hands, you should never apply a boat wax or boat sealant without first polishing your boat.� Even if you consider your boat to be the best looking one on the water, you would be surprised at the level of gloss and surface smoothness that can be achieved by using a Marine 31 boat polish. 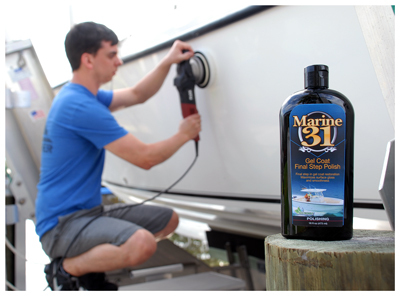 Marine 31 offers a polish for boats of all types with varying levels of oxidation.� Whether you have a brand-new Grady White boat with a custom two-tone paint scheme or an old project that hasn't received the attention it deserves, Marine 31 has a boat polish that will revive the finish while requiring minimal effort from you. Boat Polishing Tip:� Oxidation is essentially dead gel coat.� Be sure to use an ample amount of polish on your buffer to keep the surface lubricated.� This will make your polish much easier to use while actually speeding up the restoration process.� Marine 31 polishes are rich in oils that are designed to hydrate the gel coat, maximizing gloss and color. Marine 31 Gel Coat Heavy-Cut Cleaner Wax 32 oz. Marine 31 Gel Coat Gloss & Color Restorer 32 oz. Marine 31 Gel Coat Gloss & Color Restorer 128 oz.